Explore Sweden's most striking, historically significant building: bay-and-moat-ringed Kalmar Castle. Scandinavia is Western Europe's most prosperous, pristine, and progressive corner. Starting in Sweden, your Rick Steves guide will treat you to the top sights, including Stockholm's impressive Vasa Ship Museum, historic Kalmar Castle, Copenhagen's fun-loving pedestrian center, Denmark's charming Ærø Island, Oslo's proud maritime museums and whimsical Frogner Park sculpture garden, a nostalgic Norwegian open-air museum, and a waterfall-filled fjord cruise — all ending with a harborside walking tour of ruddy-cheeked Bergen. Join us for the Best of Scandinavia in 14 Days! No reviews yet for this trip. Browse other reviews below for Rick Steves. We'll meet at our Stockholm hotel at 4 p.m. for a Välkomna till Skandinavia get-together, followed by dinner and an orientation walk around our neighborhood. Sleep in Stockholm (2 nights). No bus. Walking: light. This morning we'll enjoy a walking tour through the cobbled alleyways of Stockholm's Gamla Stan (Old City), learning about its historic Stortorget Square, cathedral, and Royal Palace. After free time for lunch, we'll board a boat and cross the harbor to visit the Vasa Museum, where we'll marvel at the remains of the 200-foot warship Vasa, which sank here on her maiden voyage nearly 400 years ago. Your late afternoon is free to explore more of this cosmopolitan city. Boat: ½ hr. No bus. Walking: strenuous. This morning we'll tour Stockholm's City Hall, home of the Nobel Prize banquet and striking mosaic murals celebrating humanism and the ideal of people working together in community. Then, after stopping along the Göta Canal for a lunch break, we'll drive through beautiful birch forests on our way to the seafaring, bridge-and-water-laced town of Kalmar, where we'll sleep (1 night). Bus: 6 hrs. Walking: light. Today we'll explore what may be Sweden's most striking, historically significant building: bay-and-moat-ringed Kalmar Castle. As we tour the castle's interior and beautiful grounds, we'll learn about Sweden's 16th-century struggle for independence from the Danes. Then, to reach Copenhagen, we'll drive across the awe-inspiring five-mile Öresund bridge and tunnel connecting Sweden and Denmark. We'll get to know our neighborhood by strolling up to the lively Strøget pedestrian center, followed by dinner together at one of Denmark's oldest restaurants. Sleep in Copenhagen (2 nights). Bus: 5 hrs. Walking: moderate. This morning we'll dive into the sights and sounds of Copenhagen's historical center on a walking tour with a local guide. The rest of your day is free to enjoy Europe's best people-watching on the Strøget, tour the Renaissance Rosenborg Castle, visit the fanciful Tivoli Gardens or experience the counterculture of Christiania. No bus. Walking: moderate. After breakfast we'll drive to Roskilde to prowl through the evocative Viking Ship Museum, where we'll learn about the rough-and-tumble, yet surprisingly sophisticated, Viking culture of a thousand years ago. We'll also visit Denmark's venerable Roskilde Cathedral, the resting place of 38 kings and queens of Denmark, and the first Gothic church ever built of brick. Then a scenic ferry ride will take us to the nostalgic little island of Ærø and the old windjammer port of Ærøskøbing. Tonight we'll enjoy a traditional Danish feast together. Sleep on Ærø (2 nights, groups may be split between two B&Bs). Boat: 1½ hrs. Bus: 4 hrs. Walking: light. You'll have the morning free to relax and savor this epitome of small-town Denmark, or get Ærø-dynamic and pedal a rented bike past thatched cottages, tidy farms, and windswept bluffs. We'll regroup just before noon for a bus tour of the island, stopping en route to enjoy a tasty smørrebrød lunch together. We'll return to Ærøskøbing to tour the Old Merchants' Court and learn about island life from a local resident over tea. You'll be free for dinner and the rest of the evening. The pub by the harbor is a fun place to meet the locals. Bus: 3 hrs. Walking: light to strenuous (your choice). Today we'll drive back to Copenhagen. After some free time for lunch, we'll hop aboard an overnight ferry for Oslo. It's a big boat; choose to dine at a buffet fit for a Viking or grab something smaller at the ship's café. After dinner, you can dance the night away in the nightclub, linger in the tax-free shop or enjoy the scenery as we cruise to Norway in style. Sleep on ferry (1 night). Boat: 18 hrs. Bus: 3 hrs. Walking: light. We'll greet the sun as we glide up the Oslofjord — one of the most scenic parts of our tour — and into Norway's capital. Once ashore, we'll take a walking tour around the harbor and through the heart of Oslo, learning about Norway's history and politics along the way. With your Oslo Pass, you'll have plenty of free time to visit the Norwegian Resistance Museum, or your choice of the city's other fine museums. Before tonight's dinner, we'll gather for a visit to Frogner Park, home to Gustav Vigeland's whimsical, lifelike sculptures. Sleep in Oslo (2 nights). Bus: 1 hr. Walking: moderate. Today we'll cruise across the harbor to Bygdøy peninsula for a treasure trove of nautical history. We'll visit the Viking Ship Museum to learn about Scandinavia's best collection of Viking vessels and artifacts. Nearby, you'll also have time to see the impressive Maritime Museum — as well as special museums devoted to the innovative Fram polar explorer and the ocean-crossing rafts of adventurer Thor Heyerdahl (Kon-Tiki and Ra II). Inspired by Norway's seafaring history, you'll be free to sail back to Oslo's harbor. From there, armed with your Oslo Pass (giving you free admission to most museums and public transportation), you'll have the rest of your afternoon and evening free in this vibrant city. Boat: ½ hr. No bus. Walking: moderate. Driving northwest from Oslo, today we'll learn about daily Norwegian life and traditions. We'll tour the beautifully situated Maihaugen Open-Air Folk Museum, including its array of sod-roofed houses and remarkable 12th-century stave church, constructed entirely from wood. After a scenic afternoon drive through farmland and forests, we'll settle into our rustic, creaky mountain hotel, located in the heart of Giant's Country. 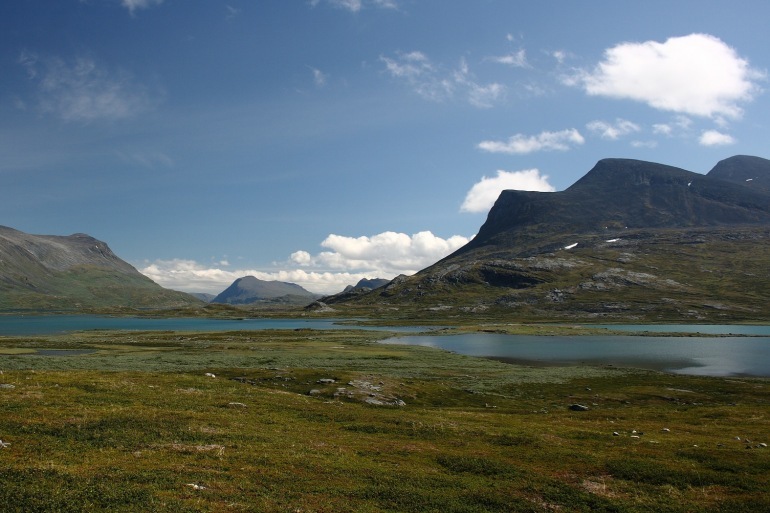 We'll share a traditional dinner together, and sleep in the Jotunheimen Mountains (1 night). Bus: 6 hrs. Walking: light. Make sure your camera is charged-up: today is scenery day! After breakfast our bus will climb the highest road in northern Europe (4,600 ft.) to the windswept Jotunheimen for a panorama of glittering snow and 8,100-foot peaks. We'll then take a dramatic corkscrew-drive down to sea level and hop aboard a ferry for a 2½-hour scenic Sognefjord cruise between cliffs and waterfalls (replicating the fjord cruise portion of the "Norway in a Nutshell" route). We'll enjoy lunch on the ferry then we're back aboard our bus for one more scenic stretch of highway before you're free for dinner and the rest of the evening in ruddy-cheeked Bergen, where we'll sleep (2 nights). Boat: 2½ hrs. Bus: 6 hrs. Walking: light. A local guide will walk us through the salty history of this seafaring town, starting at the Bryggens Museum and through the enchanting old Hanseatic wharf area, where wooden warehouses lean together and recall their glory days as a center of North Atlantic trade. To cap off our morning, we'll ride the funicular to the top of Mount Fløyen for thrilling views of Bergen, islands and fjords. The rest of your afternoon is free to do some hiking, explore more of Bergen, or buy one of those hand-knit wool sweaters that caught your eye back at the wharf. This evening we'll gather for a hearty Norwegian feast to share travel memories and toast new friends. Skål! No bus. Walking: moderate. Breakfast is provided, but there are no group activities today. Those returning home can catch a short flight from Bergen to Copenhagen, London or other European cities for your direct flight home. Farvel!